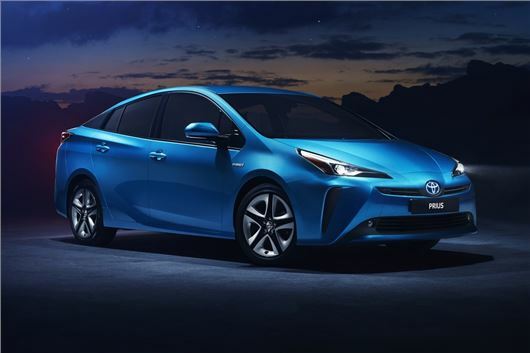 Toyota has revealed the revised Prius which will go on sale in the UK in early 2019. As well as an exterior facelift, the updated model is available with all-wheel drive, new colours and gets an improved touchscreen system. The new Hybrid AWD-i uses an extra high-torque electric motor to give drive to the rear wheels when needed. It engages automatically at speeds up to 7mph, to aid traction or when it detects a loss of grip, up to 44mph. Toyota says the unit is compact and lightweight, with 'little compromise' to the Prius’s fuel economy and emissions. It uses a new compact nickel-metal hydride battery designed for cold weather performance. The front-wheel drive Prius is equipped with a new lithium-ion hybrid battery. Styling changes include what Toyota describes as a 'cleaner look', with sleeker headlights and more conventional rear lights - the unusual vertical design being abandoned. Other changes include two new colours - Emotional Red and Aqua Breeze - along with a new 17-inch alloy wheel and a contrast dark grey finish for the 15-inch wheelcaps. The changes are minimal inside with new cloth finishes, a larger wireless charging tray and turn-by-turn navigation directions now on the head-up display. The Toyota Touch 2 touchscreen has been upgraded with faster response and responds to pinch and zoom gestures. Not quite as ugly on the outside as the existing one. Thank God. A somewhat creepy smile on the front though.